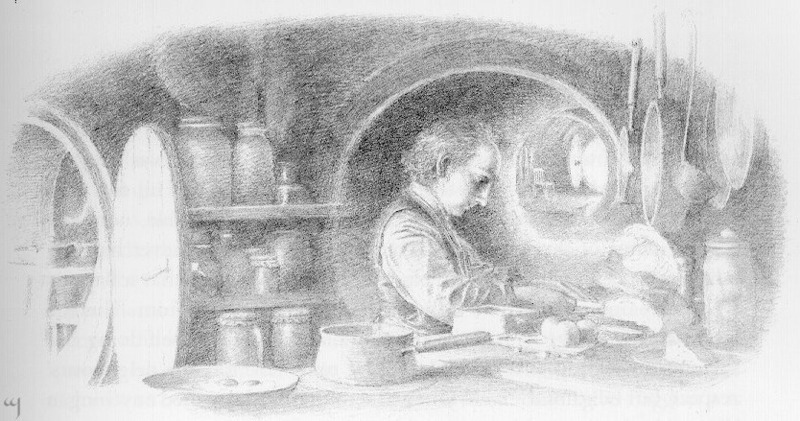 The Baggins Birthday, the Day After ~ a new poem by jan-u-wine, with drawings by Alan Lee. I have said this is a new poem, but technically it is not. Jan-u-wine wrote "Birthday" late last fall, too late to post in the 2013 Baggins Birthday entry. I considered posting it during the intervening months, but the poem really is best suited to the day after September 22. "Birthday" is about Bilbo, but it is just as much about Frodo, from whose point of view it is written. From that vantage point, we can enter into Frodo's thoughts and feelings, marveling as much at the beauty of his soul as that of the beloved hobbit he both mourns and celebrates. A blessed birthday to you, Bilbo and Frodo, and may we meet beyond the Circles of the World. falling with gentle sorrow where now he rests. I did not remember the day. 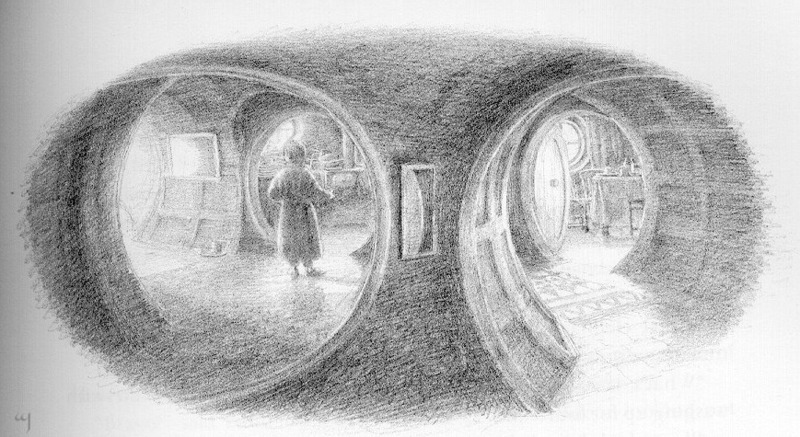 * Drawings by Alan Lee, from headings of chapters 1 and 2 of The Hobbit (Houghton Mifflin, 1997). 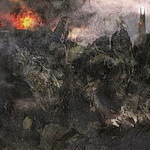 ~ "Hope" by jan-u-wine, art by John Cockshaw. Lovely. This truly draws us into Frodo's heart, mind, and soul. I call it lovely, too, Shirebound. I think it's one of my favourites. Such a lovely poem, Jan.
Frodo has so much to forget before he can be at peace and finally leave Arda himself. A birthday is of no great importance as long as he is reminded of Bilbo’s voice, his eyes, even his waistcoat, by everything around him. You are so perceptive, Ambree. Yes, I believe you are right. Me, too, Mews. :( This is one of those pieces (why not, as LOTR is one of those pieces itself) that has so much "applicability". There have been a lot of losses this year among my acquaintance, beloved family members who have died. I think this poem, exploring Frodo's feelings after the loss of his dear Bilbo, affects me even more than when I read it nearly a year ago. Yet there is sweetness in the tears, not just grief. Gandalf said it better, "not all tears are an evil". This is beautiful, Jan. It's got more of the sweet than the bitter in it--more joy at the memory of time spent in good company than sadness at the loss--what a wonderful place to be and so glad Frodo has found it in contemplation of his beloved mentor/parent. I love the phrase "moon-graced night." This is a poem I will try to keep with me--a lesson in how to move past grief through gratitude for the time you had with the lost one. Alan Lee is good at evoking this feeling, Mechtild--a sadness with more joy in it. enjoyed the artwork very much as well -- dear Alan Lee !! "rose clouds surrendering to moon-graced night "
also -- "among the waves of an unseen shore"
The font used for BIRTHDAY very atmospheric ----forgive me , this is a little disjointed --I'm tired, but happier for having read the lovely birthday poem ---thank you both very much. Mary, (((((((((((((((((you))))))))))))))). How gracious of you to stop by, read and comment, you who must be spent. But I am glad you did. I am sure Jan's piece, and Frodo in it, will do you good. What a glorious thought. This is the most loving whole-heart tribute that Frodo could make, in all its quiet love of nature, landscape and little things, a song of the very qualities that Bilbo had and awoke in him. At Bilbo's side, discovery was a constant, the years a continual conversation of the richness and magic in life. Their life together was unplanned and yet it was the saving of them both, a daily gift. The ache of separation is the measure of that love. But there is no loss here. Frodo sees, hears and feels with and for Bilbo still. "Their life together was unplanned and yet it was the saving of them both, a daily gift. The ache of separation is the measure of that love. But there is no loss here. Frodo sees, hears and feels with and for Bilbo still." Sorry to be so late here - just saw this. I love the art, I hadn't seen those before. Poor Frodo to be bereft of such a beloved uncle, part of his own heart and soul, a mirror to himself as scholar and loving the same things. But he has these beautiful memories so well portrayed here. Le hannon, my dears! on "Happy Late Birthday, Bilbo and Frodo"
Re: on "Happy Late Birthday, Bilbo and Frodo"
Jan-u-wine is a sterling Tolkien-based writer and I have loved presenting her work. If you have been using the link to all her poems featured in posts on Mechtild (the link at the bottom of the page, below the poem and illustration, also on the right in the side bar menu), you will see what a treasure trove is here. I am so glad we have given you pleasure! I can't tell you how much I missed you your posts and Jan's poems. Now I'm back and there's a lot to read it seems. So you will see me now and then. Happy new year to you, my dear! I know it will be a wonderful one, as wonderful as life is. Good heavens! Julchen! It's good to see you in print. I have heard you've had a terrible, dangerously ill year. I'm relieved to see this sign that you are truly feeling better. Hurray!